Radio star Alan Jones, who has been a vocal supporter of Orange Grove for 10 years did the official opening honours this morning. After a battle that has lasted more than 10 years, “Orange Grove” is finally open again – for the second time. Now called Fashion Spree, the controversial factory outlet centre’s opening from 9am caused mayhem on roads around it today. Traffic was affected as far as the Hume Highway, Casula, almost five kilometres away. 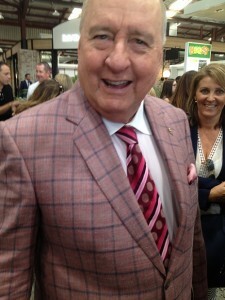 Radio star Alan Jones officially opened the modern, smart centre, which is located on the site of the former Viscount Caravans factory. Mr Jones said today’s opening was “a kick in the teeth for those who think the people in power always prevail’’. “What happened here all those years ago should never have happened,’’ Mr Jones said, referring to the first opening in 2003 and then closure after a legal challenge. “It beggars belief that a magnificent community facility was to be closed down and 400 people lose their jobs,’’ he said. Nabil Gazal spoke before Mr Jones and he told guests that Orange Grove had been a dream of his late father since 2001. Nabil Gazal Jr paid tribute to his late father, Nabil Gazal, for his fighting spirit. Nabil, who has the same name as his father – ran through the history of Orange Grove. “My father won the support of Liverpool Council, who liked the idea at the end of 2002 and it was officially opened by the then planning minister in October 2003. “The DA [development approval] was revoked in court after Westfield took legal action on a technicality. “As a result 63 businesses closed and 400 people lost their jobs. 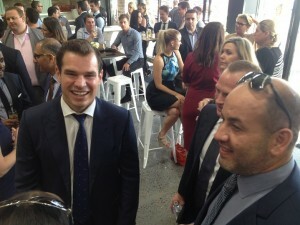 “And then the planning minister who opened it refused to sign off on the rezoning. “It was totally humiliating, the stress, the wasted investment, and dad was advised to sell the site and move on. “But dad was tenacious and decided to stay and fight. “He had fought all his life, including to get Mega Centre up and running across the road from Fashion Spree. “Tragically, cancer took him from us, so he is not here to celebrate. “But without his vision, determination and refusal to quit we would not be here today opening Fashion Spree – fully leased with 55 retailers, 30 of which are new to the area. 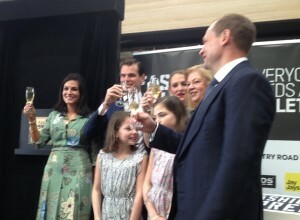 Members of the Gazal family up on stage to toast the success of Orange Grove. 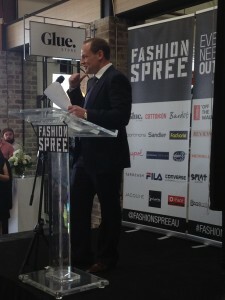 Fashion Spree will be a regional attraction for fashion shoppers because it includes brands not previously available via an outlet in south west Sydney. There is free, all day parking for more than 2,000 cars within a short walking distance, although today 5,000 spaces would not have been enough to accommodate everyone who wanted to see what all the fuss was about. Bardot, Fila, Stafford Ellinson, Giordano and Politix are just some of the exclusive stores inside the factory outlet centre called Fashion Spree. But you know it as Orange Grove and always will. 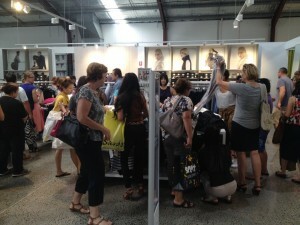 The Country Road store in Orange Grove – sorry, Fashion Spree – is swamped by shoppers this morning.